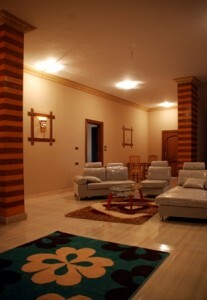 We decided to name this villa Tahrir (Arabic for freedom) after the Egyptian revolution of 25th January 2011. The villa was being built at this time and we wanted to commemorate the events. Also we felt for you, the buyer it was freedom. Freedom from grey skies, freedom from rain, freedom to live your life as you want, freedom to enjoy the Egyptian way of life. The ground floor has a large hallway with storage rooms, leading off are 4 double bedrooms with ensuite bathrooms. Stairs lead the next floor comprising kitchen and living area the same foot print. Buy Property in Egypt, Property for Sale in Egypt, Tahrir Villa. Bookmark.